Dolin is one of the last independent vermouth producers and still follows the basic recipes from 1821. Chambery is the only controlled appellation in France for the production of vermouth and Dolin is the last producer of Vermouth de Chambery. There is truly nothing else quite like it. The Dolin vermouths remain much closer to the delicate base ingredients from which they are made and are more akin to fine wine than the grocery store vermouths most of us are used to. Many people are skeptical about vermouth having never tasted a traditional hand-crafted expression before. There is only one thing you can do: try it! 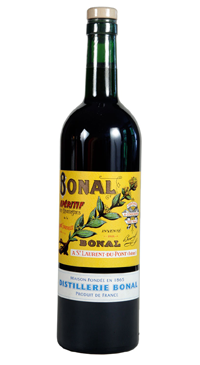 Bonal Gentiane-Quina, once referred to as “ouvre l’appetit” (the key to the appetite), is an aperitif wine that has been produced since 1865. It is made by infusing gentian root, herbs from the Grande Chartreuse mountains, and cinchona (quinine), in a Mistelle base, producing a wine that is known for its aromatic and flavour complexity. It is traditionally enjoyed neat and on ice with a twist. It is also delicious in many mixed drinks.